Go to WordPress Dashaboard -> Subscribers -> Add New. There you have option to create new GROUP for subscribers. After you have created a new group, you can use it in the widget setting. Note: Currently, you can create a new group for subscriber only during addition of a new subscriber. Finally, click on Apply button to update subscribers group for selected subscribers. Finally, click on Apply button to update subscribers status for selected subscribers. If you want to add group selection in the subscription box (i.e. 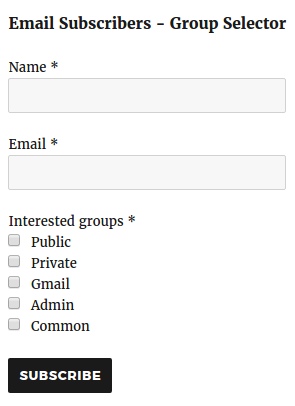 give option to subscriber to select group during signup), then use Email Subscribers – Group Selector. It is a free plugin for Email Subscribers using which you can provide option to your users to select interested groups in the Subscribers Form.